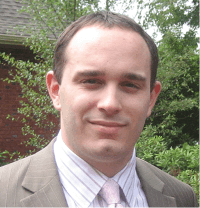 Lawrence Perruzza, BS in Biology 2003, is currently senior manager at Roche Molecular Diagnostics where he holds responsibilities for global product safety and compliance. Today I am in a position that I could not fathom as an undergraduate. However, without the opportunities and people at Monmouth University, I would not be where I am today. As I reminisce about my time as an undergraduate, I am overcome with gratitude, and a feeling of luck, that I was able to earn my degree in an environment filled with extremely knowledgeable professors that had such a passion for science and education. My journey at Monmouth University began in 1999 when I enrolled in my first biology course. At the time, I was completely clueless as to where I wanted to be in four years. When I met with my freshman advisor, I had expressed some interest in forensics, but nothing concrete. When we completed my first semester schedule, I found myself enrolled in Principles of Biology. To be honest, I wasn’t quite sure why I enrolled in a biology course; after all, I didn’t even like biology in high school, even ignoring my initial instinct to withdraw from the course prior to the first scheduled meeting. Although I didn’t truly realize it at the time, my experiences within the Monmouth University School of Science and, more specifically, my experiences with Dr. Michael Palladino (the professor for Principles of Biology), would have a tremendous impact on my life, both professionally and personally. After completing Principles of Biology, I approached Dr. Palladino and expressed my interest in spending more time in the laboratory. Initially, Dr. Palladino had suggested that I needed more core course work to start an independent research project. Although I understood that I lacked certain fundamental components of science that would enable me to be successful in the laboratory, I was still disappointed. Despite this small setback, I wanted to prove that I could be a strong contributing member of a research team without having completed upperclassman level course work. I stayed in contact with Dr. Palladino over the next few months, and toward the end of my freshman year, Dr. Palladino approached me and asked if I was interested in a summer research program. Although I had only completed freshman level biology/chemistry courses, Dr. Palladino was willing to give me a chance to prove what I was capable of accomplishing without all of the required conceptual knowledge. 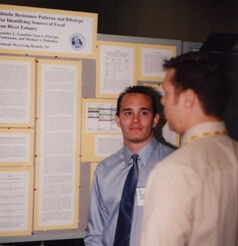 Larry Perruzza presenting his research at the American Society for Microbiology, 2001. At the end of the summer I wanted to spend more time in the laboratory and I completed another three years of independent study, which amounted to thousands of hours in the laboratory. At first, Dr. Palladino mentored me through experiments and presentations, but toward the end of my college career, I began mentoring underclassmen. I established myself as a leader amongst my fellow researchers. While the knowledge I gained within the classroom was critical to my understanding of biology, the research opportunity that was available for me at Monmouth University was the key driving factor to my success after college. The years I spent in the laboratory taught me critical thinking, both independent and team-based work, public speaking, and provided me with an opportunity to mentor and lead underclassmen. All of these skills were extremely beneficial once I graduated. These key skills enabled me to set myself apart from my colleagues and continuously take on new, more challenging roles with higher levels of responsibility and accountability. After graduating in 2003, I took an associate scientist position with an in vitro diagnostic manufacturer, Roche Molecular Diagnostics, which specializes in polymerase chain reaction (PCR) diagnostic tests that detect and monitor disease conditions, and are used for blood screening applications. In 2007, I enrolled in a part-time graduate program at Temple University and in 2010 I graduated with an M.S. in Pharmaceutical Quality Assurance and Regulatory Affairs. Currently, I am a senior manager at Roche Molecular Diagnostics with responsibilities over global product safety and compliance, which includes adverse event reporting, product recalls, and compliance inspections. This is a challenging, yet critical and rewarding position. Without safe and effective products, patient medical management decisions, which are derived from diagnostic test results, would be inaccurate and could potentially result in serious health consequences for patients. As with my career progress to date, I continuously strive for new, challenging opportunities that including additional responsibilities and a greater level of accountability. My goal is to establish myself as an influential organizational leader within this industry.